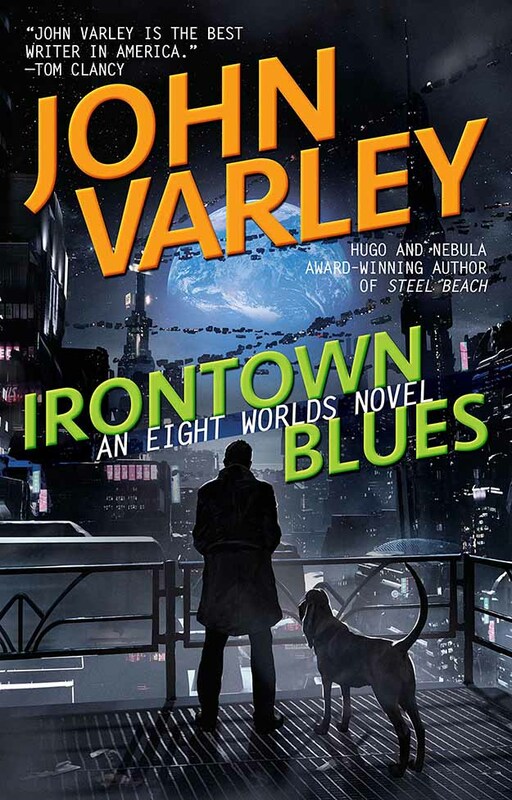 I’ve loved Varley’s work since first reading his short stories in the SF digest magazines in the 1970s. I think of him as a “Heinlein school” writer, and the inclination in his work to use the themes and settings of Robert A. Heinlein as stepping-off points or homages has grown over the years. As Heinlein is one of my favorite writers, I have no problem with this, and it’s not like he’s imitating or retreading, he goes his own way, but the love for RAH is evident and strong. This one is reminiscent of “The Moon Is A Harsh Mistress” taken further down the road, with other Heinlein novel elements in there too. Chris Bach lives on Earth’s moon, but in his head he’s in 1930s film noir. He lives in an area where that era is recreated lovingly, and he works as a private detective, he and his partner Sherlock, a bloodhound. Sherlock is not an ordinary dog, he’s a CEC, Computer Enhanced Canine, with implanted links to the web and enhanced intelligence. Sherlock is a master of scents, of course, and he co-narrates the book with the help of a CEC communications expert who interprets his non-verbal language and translates it for us readers. Sherlock’s narration is often more interesting than Chris Bach’s. As is expected for a private detective, Chris has a troubled past that we learn about in the story, he was part of a raid on some off-the-grid inhabitants of the Moon he thought was a simple clean-up operation, but it turned out to be much deadlier and more sinister. He barely survived. Chris’s new client seems to want to drag him and Sherlock back to the place where it happened, Irontown. Chris is reluctant to go there for good reason. Sherlock wants only to protect Chris. Neither of them are going to get what they want or expect when they finally get to Irontown. This entry was posted in Books, Reviews on February 11, 2019 by Todd.